Few squares of dark chocolate, melted. Roll the pastry out to about 15inch x 15 inch, mark 8 rectangles off prior to baking (makes it easier to get a clean cut when cooked), prick well with a fork and bake at gas mark 5 until just starting to turn light golden brown. Cut rectangles out of pastry and put on a cooling rack to cool. To make the vanilla filling, combine sugar, salt and cornstarch in a saucepan. Add milk and whisk together. Bring the mixture to a light boil over medium heat while whisking constantly. Lower to a simmer and whisk until thickened, about 5 minutes. Remove from heat and add margarine and vanilla. Pour into a bowl and let cool, stirring every few minutes. Filling will continue to thicken as it cools. Leave until cold. 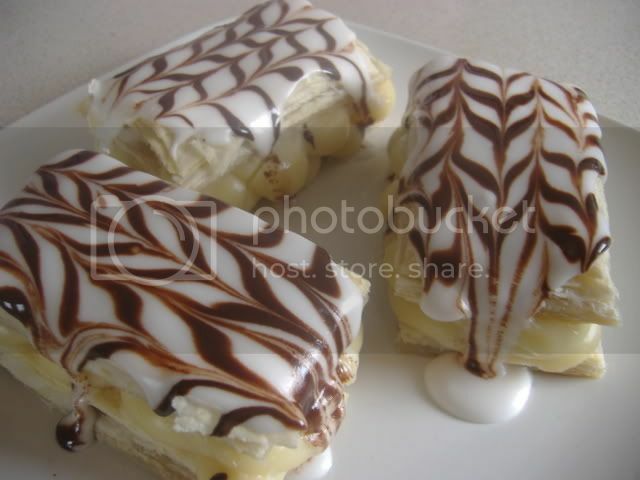 Assemble pastry slices with custard filling in middle. Put icing sugar, vanilla essence in bowl, add in cold water a bit at time until you've got a smooth, thick, icing. Spread icing on top of vanilla slice. Drizzle chocolate in lines across top of icing and 'feather' using cocktail stick or skewer. Chill for a while and then eat! Oh My God! They shouldn't be allowed!! I've got to have me some! Dang! Those are gorgous. I wish I could do stuff like that. I can't use puff pastry. I showed my husband the picture of them and he said you can really eat things like that being a vegan? hahaha aphrodite - your husband really is a hoot. You should come round to ours one night - I'll show him how damn good vegan food it. May even whip up a batch of these babies! feel free to - with notice! They look fab! Ever thought of going into the vegan cake business? I'll be your first customer. I made them on Sunday Cedar, had a hankering for a vanilla slice for a while so I thought I'd have a go....and they turned out rather well! oh wow...i might have to make these tomorrow! I so want to make them... not sure if I can find vegan puff pastry here (or puff pastry at all... never used it). I am going to try making these tonight. Are there any tricks or anything I should know about using puff pastry? I have never used it. Found some vegan stuff though! Hmm, don't think there's anything in particular....other than pricking it all over with a fork after you've rolled it out and marked the rectangles out so it doesn't rise too much (I really ought to put that in the instructions didn't I?). LOL I've sent the email already! Haha bryzee, mine did the exact same thing. But after they chilled I was able to clean them up and still put on the chocolate (which was very sloppy). But... I am still taking them when I go visit my boyfriend when I get off work today. They taste yummy anyway, even if they are not very pretty. Oh well. I think the trick with them is that the custard and the icing need to be thicker than you think is possible to work with to avoid it running and squidging out everywhere....I also piped the custard on (maybe I should have mentioned that too ) so that I didn't have to handle them too much. I'm sorry bryzee and fondducouer have had problems with them...it's a bit embarassing when mine went so well! !